For over 250 years, political cartoons have used humor and exaggeration to reach people on a variety of topics, even if they can't read. Learn how to use this powerful communication tool as you explore a political cartoon from the past, share the history of its conception, and use what you have learned to create your own cartoon based on a current event. Students have most likely seen a political cartoon, though they may confuse political cartoons with a single-panel illustration designed simply for humor. More than just a funny drawing, a political cartoon is a pointed commentary on a current event or the actions of a person or group in politics. Show students Ben Franklin's “Join or Die” cartoon, but don't explain its meaning or origin. Ask them if they have seen this image before. What do they think it might mean? Bring up Ben Franklin or the early American Colonies and see if that helps them recognize that the initials in the image represent colonies. Franklin's “Join or Die” is generally acknowledged as the first political cartoon in America, published first on May 9, 1754 in Franklin's Pennsylvania Gazette. Franklin drew this image to generate support at the Albany Congress for his idea of an intercolonial association to respond to the threat of the Iroquois. 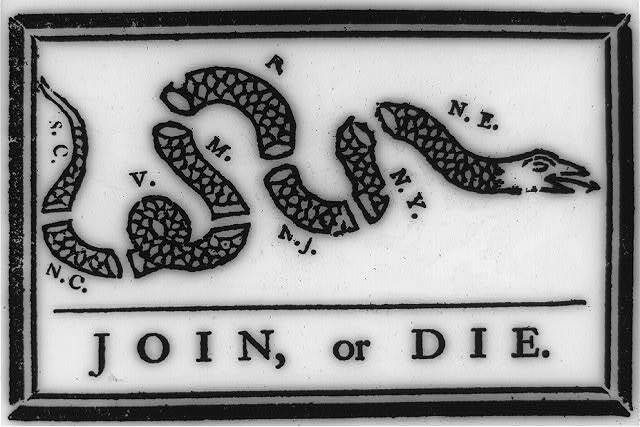 “Join or Die,” and this image of the snake, quickly became symbolic of the cause of colonial unification. Select a current political cartoon that reflects a recent topic or event your students are familiar with. You may also want to ask students to locate a political cartoon in a local paper or using an online source as a homework assignment. Project or distribute the cartoon so all students can view it. What historical moment does the comic depict? 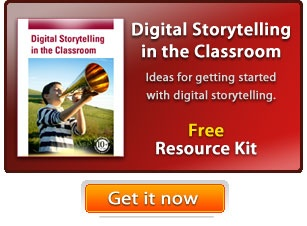 Ask students to share additional information they know or research about the topic or event. What visual elements are present in the cartoon? Discuss what students can see and read in the cartoon. Explore how the cartoon uses caricature to enhance the meaning. Provide students with analytical tools and questions they can use to decode and understand other political cartoons. The Library of Congress has a great cartoon analysis guide that discusses how political cartoonists use symbolism, exaggeration, labeling, analogy, and irony to communicate their point of view and message. Have each student choose a time in history that interests them. Task them with the job of searching the web or exploring sites like Cartoons for the Classroom and About.com's Political Humor to find a specific cartoon they want to examine and analyze. If you are concerned about students' ability to analyze on their own, or if you want to provide additional support to students, have them work in small teams to choose and analyze a cartoon. Distribute the National Archives Cartoon Analysis Guide to each student to help direct their analysis. Have students use the information from the completed worksheet to create a 1-3 paragraph analysis of their political cartoon that could be used to help other students make sense of the illustration and the subject it depicts. Have students launch Share and open the Cartoon Scrapbook template (Project>New>Templates>Social Studies). Students can click and drag the cartoon onto the image placeholder to add to the page. Once the image is added, they can use the resize handles to adjust its appearance. They can type or copy and paste their written analysis into the text box. You can also search for “political cartoon” in Wixie and assign this activity to your students. The template also provides a page for students to draw their own political cartoon. You may choose to have them create another political cartoon depicting the same time period or select a current event or person as the subject for their satirical illustration. Students can use the clip art and drawing tools to make their caricatures and scene or import an image they illustrate on paper. Students can use the text box below the image to summarize their work or to create a caption that supports the illustration. You could also use political cartoons to explore a single historical period in greater depth. Instead of having individual students create their own scrapbooks, locate and assign a selection of political cartoons and have students work individually or in small teams to complete an analysis. Have students compile their work on the “example” page of the Share template and then click the Share button on the toolbar to combine everyone's work into a single class book! Give each student or team an opportunity to present their analysis to the entire class or to small groups of students. You can also export student work as as ePubs you can share as a resource for other students. Click the Project button, Export as an ePub, and upload the files to your iBooks or Google Drive for distribution. If you don't use eReaders, you can instead export students' work as PDF files for easy sharing. You can assess student's prior knowledge and analytical skills as you begin discussing Franklin's “Join or Die” cartoon. You can continue to evaluate their ability as you ask questions during their analysis of a current event and examine their individual exploration using the Cartoon Analysis worksheet from the National Archives. Be sure to ask clarifying questions to ensure that students understand how author's/illustrator's use symbolism, exaggeration, analogy, and/or irony. You may find it necessary to revisit these terms, their definitions, and their applications. During students' presentations of the completed analyses, ask the class to serve as evaluators of success. After a few students have shared, talk as a class about what makes a great cartoon and what constitutes an effective analysis. 6. Identify aspects of a text that reveal an author's point of view or purpose (e.g., loaded language, inclusion or avoidance of particular facts). 8. Distinguish among fact, opinion, and reasoned judgment in a text.